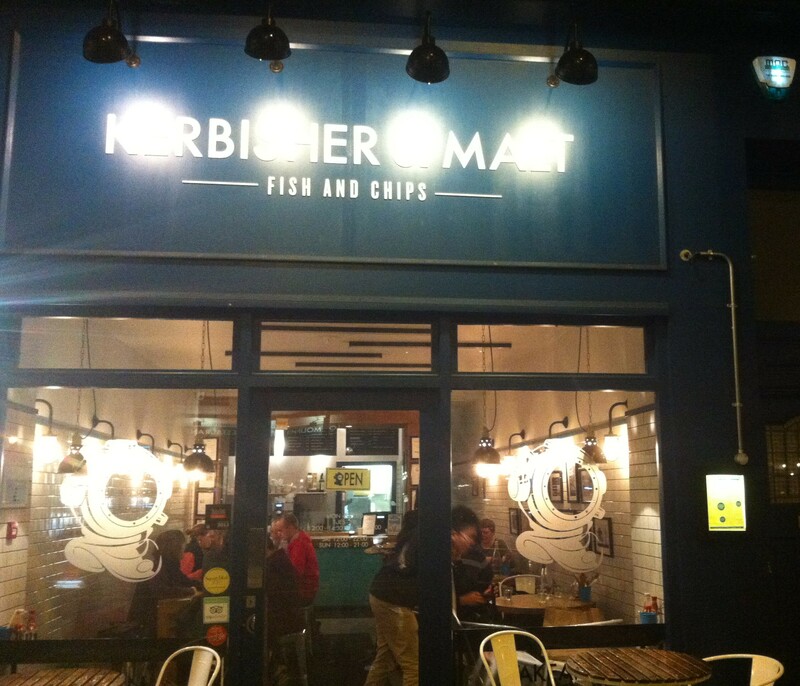 Kerbisher & Malt | Restaurants of the World Unite! What could be more English than chips and fish mate yes? England goes up on the Big Board. I suppose I could use this for the whole of the UK but I’m curious to see if Welsh and Irish cuisines are represented in London. A burger at O’Neills does not count. My wife-to-be went, counter to my instructions, and celebrated her hen party prior to my taking full ownership. I’m now rethinking my decision not to install a Fritzl-cellar in the new place. This left me at a lose end and finding myself bored and hungry after duffing up a tramp down an alley way, I popped into Kerbisher and Malt (http://www.kerbisher.co.uk/). 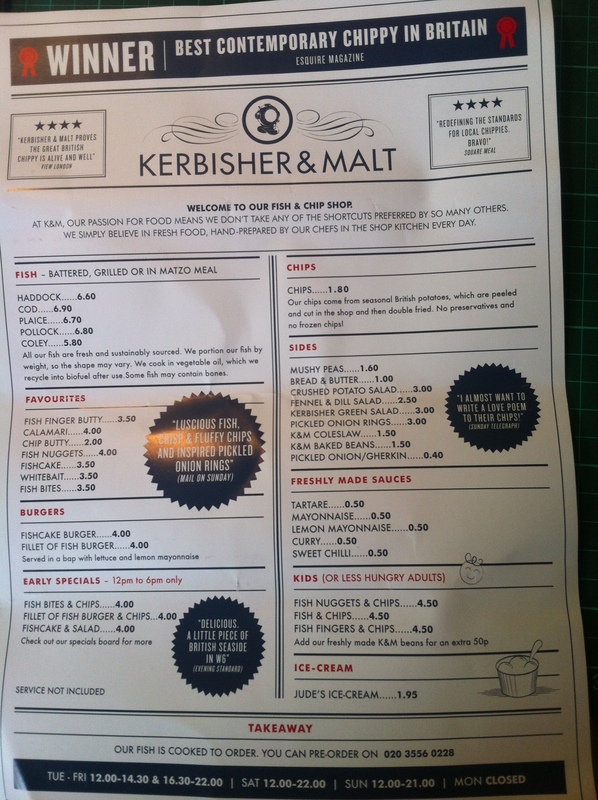 I have now figured Kerbisher and Malt out: Eat in. I’ve taken out a few times and it’s always been a bit meh. 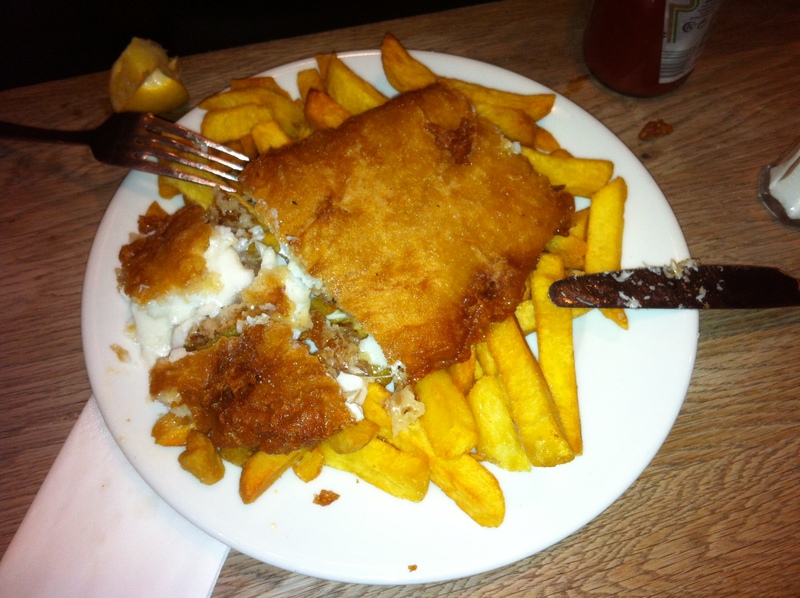 The portion of fish was small and the chips so so. But eating in for some reason, and for the same price, you get a much bigger bit of fish and it doesn’t cool down on the journey home. Eating in is a pleasant experience, the white-tiled walls reminding me of my favourite restaurant in Bruxelles (Pre Salé), and a low hum of music. The best thing is how quickly the food arrived. The haddock was beautifully cooked and the batter was up there with the best I’ve had. I’m reluctant to go for cod these day due to a rumour I heard (probably put out by the anti-overfishing lobby. Bleeding hearts). I shan’t repeat it. Every chump claims that the fish and chip shop from near where they come from is the best in the UK. Those idiots. In fact the best place is near where I come from in Adleburgh called, imaginatively, Aldeburgh Fish & Chips (http://www.aldeburghfishandchips.co.uk/). Go there in summer and expect to wait for an hour. Well worth it.